To Cite: Moazen B, Ebrahimi E, Nejatollahi F. Single Chain Antibodies Against gp55 of Human Cytomegalovirus (HCMV) for Prophylaxis and Treatment of HCMV Infections, Jundishapur J Microbiol. 2016 ; 9(3):e16241. doi: 10.5812/jjm.16241. Background: Immunotherapy is a promising prospective new treatment for cytomegalovirus (CMV) infections. Neutralizing effects have been reported using monoclonal antibodies. Recombinant single chain antibodies (scFvs) due to their advantages over monoclonal antibodies are potential alternatives and provide valuable clinical agents. Objectives: The aim of this study was to select specific single chain antibodies against gp55 of CMV and to evaluate their neutralizing effects. In the present study, we selected specific single chain antibodies against glycoprotein 55 (gp55) of CMV for their use in treatment and diagnosis. Materials and Methods: Single chain antibodies specific against an epitope located in the C-terminal part of gp55 were selected from a phage antibody display library. After four rounds of panning, twenty clones were amplified by the polymerase chain reaction (PCR) and fingerprinted by MvaI restriction enzyme. The reactivities of the specific clones were tested by the enzyme-linked immunosorbent assay (ELISA) and the neutralizing effects were evaluated by the plaque reduction assay. Results: Fingerprinting of selected clones revealed three specific single chain antibodies (scFv1, scFv2 and scFv3) with frequencies 25%, 20 and 20%. The clones produced positive ELISA with the corresponding peptide. The percentages of plaque reduction for scFv1, scFv2 and scFv3 were 23.7, 68.8 and 11.6, respectively. Conclusions: Gp55 of human CMV is considered as an important candidate for immunotherapy. In this study, we selected three specific clones against gp55. The scFvs reacted only with the corresponding peptide in a positive ELISA. The scFv2 with 68.8% neutralizing effect showed the potential to be considered for prophylaxis and treatment of CMV infections, especially in solid organ transplant recipients, for whom treatment of CMV is urgently needed. The scFv2 with neutralizing effect of 68.8%, has the potential to be considered for treatment of these patients. The specific scFv1 and scFv3 with lower neutralizing effects can be used for diagnostic purposes. Human cytomegalovirus (HCMV) prevalence in the general population is about 70% (1). The infection is an important cause of morbidity and mortality in infants and immunocompromised individuals such as solid-organ and hematopoietic stem cell transplant recipients, AIDS patients and patients taking chemotherapy or medicines with suppressed immune system (2-7). The HCMV accounts for major viral complications in the post-transplant period (6) and is also the most common intrauterine infection that may lead to sensorineural hearing loss and mental retardation (8, 9). Several antiviral medications are available to treat CMV. These medicines require close monitoring for side effects and although they can help stop the virus from copying itself within the body yet do not eliminate it from the body (10-12). Therefore, there is a need for new treatment modalities. Immunotherapy is a promising new treatment for infectious diseases involving both therapeutic vaccines and monoclonal antibodies (13). Glycoprotein 55 (gp55) is part of glycoprotein B (gB), which is the most abundant constituent of HCMV envelope and the major target for neutralizing antibodies (14, 15). Several monoclonal antibodies have been generated against gB epitopes and showed some degree of neutralization (16). Recombinant antibodies (rAb) are becoming the preferred therapeutic substitutes to full-length monoclonal antibodies due to their characteristics. Single-chain fragment variable antibodies (scFv), which are composed of variable heavy (VH) and variable light (VL) domains linked together by a flexible polypeptide linker, are one of the most desired rAb formats. The smaller size, human origin, high affinity and specificity and also better penetration to their targets, are beneficial characteristics of human scFvs in medical applications (17-20). These antibodies have been introduced as valuable agents for immunotherapy (21). This study aimed to select specific single chain antibodies against the conserved sequence of gp55 and to evaluate the virus neutralization effects of the antibodies in cell culture using the phage display technology. A phage antibody display library of scFv was produced, as described previously (16, 17). Escherichia coli bacteria containing phagemid were cultured overnight on 2TYG agar /ampicillin (tryptone, yeast extract, glucose, agar and ampicillin) (Merck, Germany) plates at 30ºC. The bacteria were scraped and incubated in 2TYG broth at 37ºC for one hour. M13KO7 helper phage was added and incubated at 37ºC for 30 minutes. This was followed by shaking for 30 minutes. The culture was centrifuged at 3500 rpm for 20 minutes. The bacterial pellet was transferred to 2TY broth containing ampicillin (100 μg/mL) and kanamycin (50 μL/mL), and incubated with constant shaking, at 30ºC overnight. The culture was centrifuged at 5500 rpm for 30 minutes. The supernatant was passed through 0.3 μm filters and stored at 4ºC (22). Peptides (LVSADGTTVTSGSTKDTSLQ) at a concentration of 10 μg/mL were coated on polystyrene immunotubes (Nunc, Denmark) at 4ºC overnight. The tubes were washed four times with phosphate buffered saline (PBS), and 4 mL of blocking solution (2% skimmed milk) was added and incubated at 37ºC for two hours. The tubes were washed four times with PBS/ Tween and four times with PBS. In the next step, the diluted phage supernatant in the blocking solution (1/1) was added to the tubes and incubated at room temperature for one hour with occasional inversions. The tubes were washed and logarithmic phase E. coli was added, followed by incubation at 37ºC for one hour and centrifugation at 3500 rpm for five minutes. The supernatant was discarded and the bacterial pellet was re-suspended in 2TY broth (tryptone, yeast extract) (Merck, Germany), plated on 2TY agarose/ampicillin plate and incubated at 30ºC, overnight. Four rounds of panning were performed to select specific scFv antibodies against the peptide. After the panning process, the inserts of selected clones were amplified by PCR (94°C for one minute, 55°C for one minute and 72°C for two minutes, performed in 30 cycles). Furthermore, 17 μL of the PCR product was mixed with 1 μL restriction enzyme (Mva-I) (Roche Applied Science, Germany) and 2 μL of restriction enzyme buffer. The mixtures were placed in a dry block heater at 37ºC for two hours and run on a 2% agarose gel. Peptides (100 μg/mL) as an epitope were coated in 96 wells of a polystyrene plate and incubated at 4°C overnight. After washing with PBS, 150 μL of blocking solution (2% skimmed milk) was added to each well and incubated at 37ºC for two hours. The wells were washed with PBS/Tween and PBS. Phage rescue supernatant containing the appropriate scFv, diluted with blocking solution (1:1), was added to each well and incubated at room temperature for two hours. Nonbinding phages were removed by washing the wells three times with PBS/Tween, and three times with PBS. Anti-Fd bacteriophage (1:100) (Sigma, Germany) was added to each well and incubated at room temperature for 1.5 hours. The wells were washed three times with PBS/Tween and three times with PBS. horseradish peroxidase (HRP) conjugated anti-rabbit antibody (1:1000) (Sigma, Germany) was added to each well and incubated at room temperature for one hour. The wells were then washed and 150 μL of Azino-bis-3-ethylbenzothiazoline-6-sulfonic (ABTS) acid (Sigma-Aldrich, Germany) solution (10 mg ABTS, 20 mL citrate buffer (PH4) and 6 mL H2O2) was added to each well. The absorbances were read at 405 nm after 30 minutes using an ELISA reader. The wells without peptide, with unrelated peptide (prostate stem cell antigen peptide), unrelated scFv (scFv to HER2) and with M13KO7, were also considered as negative controls (22). The anti-CMV effects of scFvs were evaluated by the plaque reduction assay. The HCMV (AD169) was diluted in dulbecco’s modified eagle’s medium (DMEM) (Sigma-Aldrich, Germany) to 50 pfu/mL. Equal amounts of virus and each scFv phage rescue supernatant were mixed and incubated at 37°C for one hour. The mixtures were added to the wells of 24-well plates containing confluent human fibroblast, which were then rocked gently for 45 minutes at 37°C. The mixtures were removed and 1 mL of 1% w/v carboxy methyl cellulose (CMC) in 1x DMEM, supplemented with 2% fetal calf serum, 0.14% v/v sodium bicarbonate, 100 U penicillin ml-1, 100 μg streptomycin sulfate ml-1, 0.25 μg amphotericin B ml-1 and 0.1 M sodium hydroxide, was added. The number of micro plaques were counted after ten days and compared with the number of plaques seen in the virus control wells containing virus in DMEM. DNA Fingerprinting of selected clones was performed to determine the common patterns after the panning process. As shown in Figure 1, DNA fingerprinting of the selected clones demonstrated pattern 1 (scFv1), (lanes: 1, 2, 5, 8, 13) with frequency of 25%, pattern 2 (scFv 2), (lanes: 4, 7, 11, 14) with frequency of 20% and pattern 3 (scFv3), (lanes: 3, 15, 17, 20) with frequency of 20%. The other patterns had frequencies of 10 and 5%. Dominant patterns (patterns 1, 2 and 3) were selected for further evaluation. Three predominant patterns were differentiated including pattern 1 (Lanes 1, 2, 5, 8 and 13), pattern 2 (Lanes 4, 7, 11 and 14) and pattern 3 (Lanes 3, 15, 17 and 20). M: ФX174DNA marker. 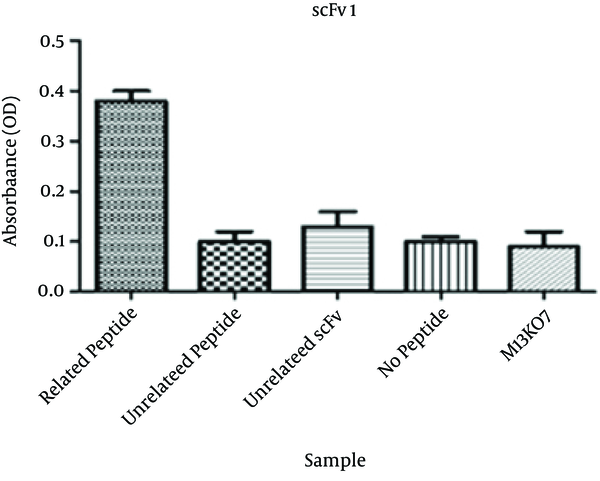 Specific binding of the selected scFv antibodies to the corresponding peptide was determined by phage ELISA. The absorbance of wells coated with the corresponding peptide for the three selected scFvs were significantly higher than that of the wells containing no peptide. The ODs were more than three times higher than the no peptide wells. The absorbances at 405 nm are shown in Figures 2 - 4. Table 1, shows the percentages of plaque reduction when the virus was incubated with scFv. As the results indicate only scFv2 efficiently neutralized the virus and a neutralizing effect of 68.8% was obtained. The neutralizing effects of scFv1 and scFv3 were 23.7 and 11.6%, respectively. aNumber of Plaques are shown in each experiment. Following incubation of virus with scFv2, the highest plaque reduction (68.8 %) was obtained. The control well contained no antibody. Several immunodominant CMV peptides have been considered as antibody targets in immunotargeting studies. Glycoprotein B is known as the most abundant constituent of the HCMV envelope and the major target for neutralizing antibodies. It contains three major neutralizing determinants including AD1, AD2 and AD3 domains (23-25). The HCMV peptides derived from the N-terminal part of gB (NETIYNTTLKYGDV) and C-terminal part of gB (VTSGSTKD) in the AD2 region and N-terminal part of gH (PAASEALDPHAFHLLLNTYGR) have been used to develop recombinant anti-HCMV gB and gH. This resulted in the isolation of eight neutralizing clones with neutralizing effect of 51% - 63% (16). Due to recent reports showing the association of CMV diseases with the lack of antibodies against the AD2 region in renal transplant individuals (23). In the present study, a well-known peptide in the AD2 region was considered as the target epitope and a phage display library of scFvs was applied to select specific antibodies against this epitope. The peptide (LVSADGTTVTSGSTKDTSLQ), amino acids 789 - 805 derived from the C-terminal end of the part of gB (gp55) was used as an epitope. It has been shown that the sequence of AD2 domain is conserved among CMV isolates (26), which makes it more attractive for CMV targeted therapy. The VTSGSTKD epitope of AD2 has been reported as a major antigenic region on gp55 with the VTSG part, which is essential for recognition. It was found that 55% of the anti-HCMV seropositive blood samples recognize the TSGSTKD epitope, which is part of the applied peptide. In order to select specific scFv antibodies against the epitope, the panning procedure was done on the library. After four rounds of panning against the derived peptide, 20 clones were selected and Mva-І fingerprinting demonstrated the common patterns. Three specific scFvs were selected with frequencies of 25% (scFv1), 20% (scFv2) and 20% (scFv3). The other patterns showed frequencies of 10 and 5%. Specific scFv antibodies against different pathogens have been used to target microorganisms. Lillo et al., (27) selected scFv antibodies against a capsular protein (F1 antigen) of Yersinia pestis by enrichment of a phage library using the panning process. Krishnaswamy et al., (28) identified a specific scFv antibody against A. fumigatus membrane fraction (AMF) as an antigen by panning a phage antibody. The results of the phage ELISA showed that the panning procedure was successfully performed and the selected clones reacted specifically with the peptide. 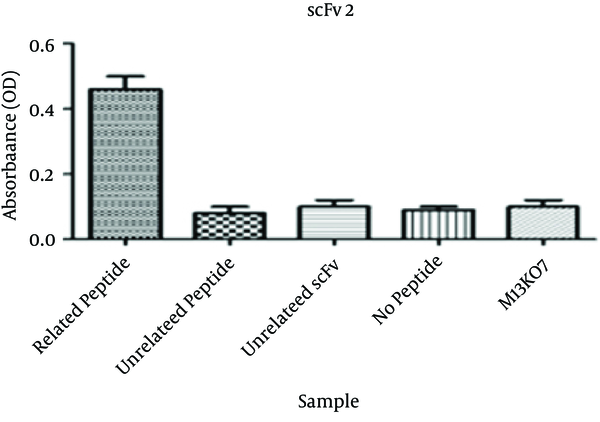 The three selected scFvs (scFv1, scFv2, scFv3) produced positive ELISA with the CMV peptide, while no reactivity was detected for the control peptide, helper phage and no peptide wells as negative controls. Furthermore, the unrelated scFv (scFv to prostate stem cell antigen peptide) didn’t react with the gp55 peptide. The absorbances of wells coated with peptide of interest for the three selected scFvs were three folds higher than that of the wells containing no peptide. 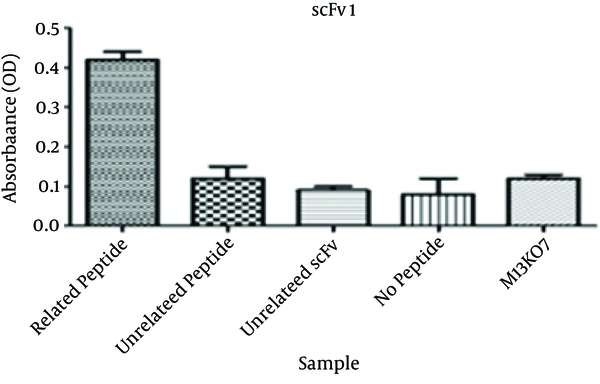 The specificity of selected scFvs to the corresponding peptides has been shown in different phage ELISA assessments. Thathaisong et al., (29) showed that the optical density (OD) of specific scFvs against influenza-A virus H5N1 subtype at 405 nm was two folds higher than negative controls in a positive phage ELISA. Specific single chain antibodies to outer membrane protein D (OmpD) of Salmonella typhimurium (30), staphylococcal enterotoxin B (SEB) (31) and hepatitis B virus (HBV) surface antigen (32) have also been confirmed by phage ELISA. Further evaluation was performed on the selected scFvs in a neutralizing assay. The scFv2 showed a mean plaque reduction of 68.8% while the mean of plaque reduction for scFv1 and scFv3 were 23.7 and 11.6%, respectively. Although monoclonal antibodies have been produced against human cytomegalovirus gB and gH (33, 34), the application of these antibodies in clinical settings is limited due to human anti-mouse antibody (HAMA) response and most of these antibodies have been used for diagnosis purposes. New treatment options for CMV are urgently needed because currently available therapies have major limitations. It has also been reported that the management of solid organ transplant recipients for prevention and treatment of CMV disease is a major strategy since a significant correlation between steroid administration for acute cellular rejection (ACR) and CMV reactivation and disease has been shown in liver transplant recipients (35). The results suggest that the specific scFv2 with neutralizing effect of 68.8% has the potential to be used for prophylaxis and treatment of CMV infections. As the epitope used for selection of the specific antibodies is a conserved epitope among different CMV strains, the antibody is able to neutralize different CMV strains and would be helpful for clinical applications. The specific scFvs 1 and 3 with lower neutralizing effects can be used for diagnosis of CMV-related diseases. A combination of the selected neutralizing scFv in this study with the previously selected neutralizing scFvs and scFv against the N-terminal part of gB with 57% and scFv against gH of CMV with 63% neutralizing effects (16), could be an effective alternative cocktail for therapy of at risk patients such as transplant recipients and AIDS patients. Further investigations are needed to show the effects of the selected antibodies in vivo. The authors would like to acknowledge the Shiraz University of Medical Sciences for their financial support. The present article was extracted from a thesis written by Elahe Ebrahimi, for the degree of doctor of Medicine, grant number 2859. Funding/support: This work was financially supported by the Shiraz University of Medical Sciences.